The first non-stop rock video channel was launched in the US in 1981. 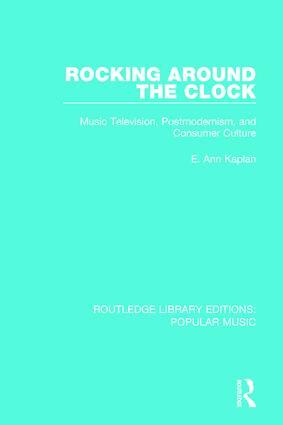 As a unique popular culture form, MTV warrants attention, and in this, the first study of the medium, originally published in 1987, Ann Kaplan examines the cultural context of MTV and its relationship to the history of rock music. The first part of the book focuses on MTV as a commercial institution, on the contexts of production and exhibition of videos, on their similarity to ads, and on the different perspectives of directors and viewers. Does the adoption of adolescent styles and iconography signal an open-minded acceptance of youth’s subversive stances; or does it rather suggest a cynicism by which profit has become the only value? In the second part of the book, Kaplan turns to the rock videos themselves, and from the mass of material that flows through MTV she identifies five distinct types of video: the ‘romantic’, the ‘socially conscious’, the ‘nihilistic’, the ‘classical’, and the ‘postmodern’. There are detailed analyses of certain videos; and Kaplan focuses particularly on gender issues in videos by both male and female stars. The final chapter explores the wider implications of MTV. What does the channel tell us about the state of youth culture at the time?